Spot silver prices edged marginally higher yesterday with trading confined to a very narrow range and sandwiched between the 40 day moving average to the downside and the 9 day moving average to the upside. Indeed it could be argued that the 40 day provided support whilst the 9 day offered resistance. Yesterday’s price action gives us little in the way of a short term intra day trading signal for spot silver other than to indicate that the recent bearish sentiment of the last two days has faded. 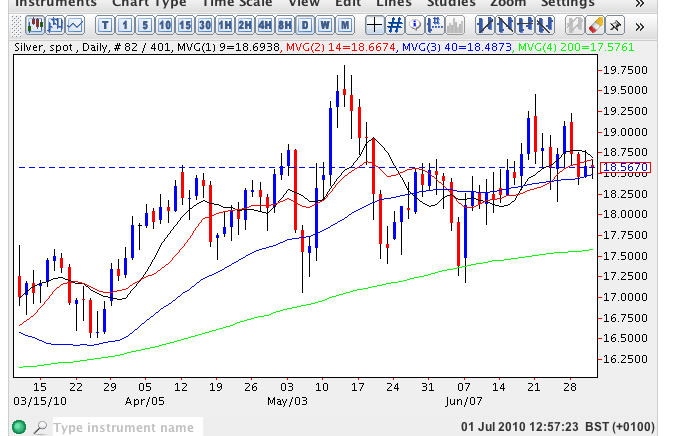 Indeed this was confirmed in early spot silver trading this morning with the 40 day moving average providing support to a move lower and pushing spot silver prices back above 18.60 once again. Our longer term forecast still remains firmly bullish provided we see an initial break above 19.23, followed by a move higher and a breakout above 19.80 then 20.00 per ounce should be achieved in the medium term with the outlook for spot silver remaining very positive for the remainder of the year.